Two months before ALTO Tower closed I went out for a final round of photos on a sunny spring day and while I was there I spent some time at the satellite interlocking CP-SLOPE, which was under direct wire control from ALTO tower. The old SLOPE tower was closed in the 1950's with a relay plant being constructed on the foundation. 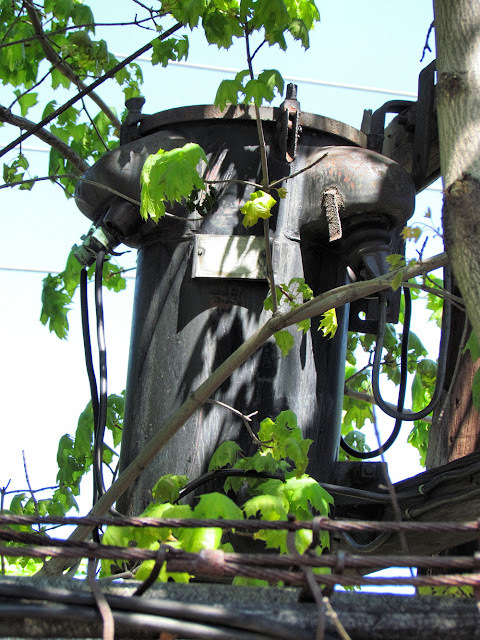 However the power supply for the interlocking remained much as it was when the tower was open. 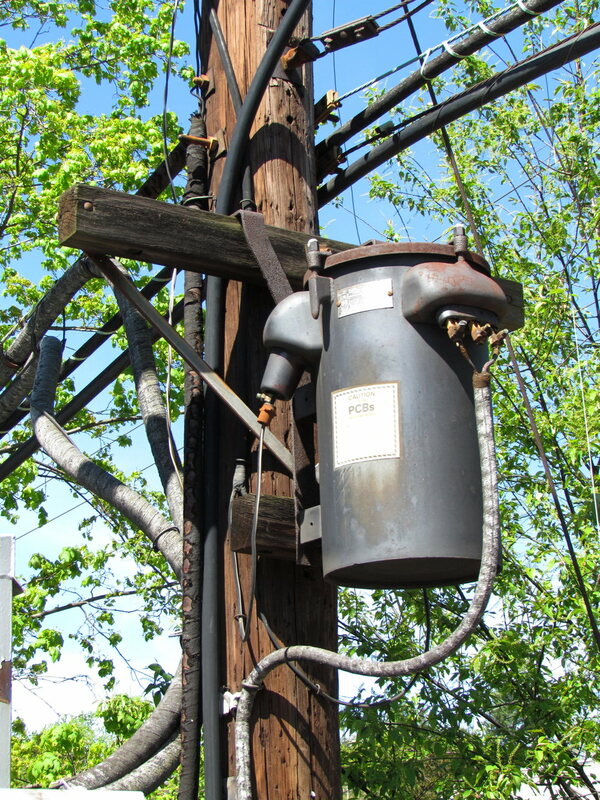 Pole line power is nothing new in my experience, however the PRR was not about to be satisfied with some dinky 440 volt wires on a telegraph pole and SLOPE was fed from ALTO through a thick bundle of signal wires to a number of vintage 1930's or 1940's "Pole Pig" at the westbound signal gantry. 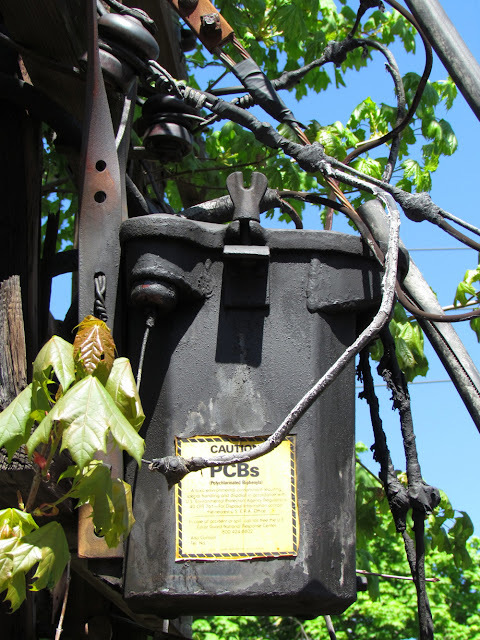 Hmmm, what's that sticker on the side of the transformer. Let's take a closer look. 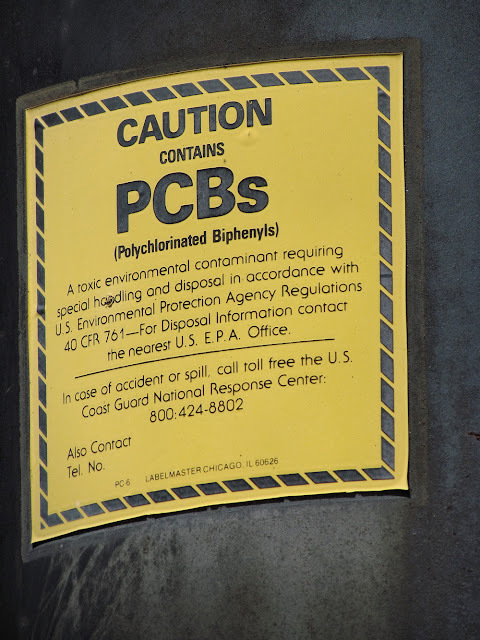 Yup, good old PCB's. Except no substitutes when cooling a transformer. In what could be the ultimate example of "if it ain't broke" this power supply lasted past the closing of the tower, past the formation of the Penn Central and Conrail and right up to the point that ALTO itself was closed and eliminated with those persistent organic pollutants staying stable, year in, year out. This wasn't the only example either. There were two more at the SLOPE relay plant. I have asked around, but have not been able to definitively date these transformers except that they probably date from the 30's or 40's. Help would be appreciated. Last week it was reported that the Long Island Rail Road had "retired" its Train Order system inherited from the old PRR Standard Code rulebook. The last Form 19 Train Order was issued on September 3rd at 11:59, removing the Form 19 from use as a train order device. Prior to this the venerable Form 19 had only been used to deliver speed restrictions and other miscellaneous instructions with movement authorities being transferred to the new LIRR Form L. While some had assumed this to mean that the LIRR was now using a modern Track Warrant system with paperwork similar to a NORAC Form D or MNRR Form M, the truth is that this only represented a change in paperwork. 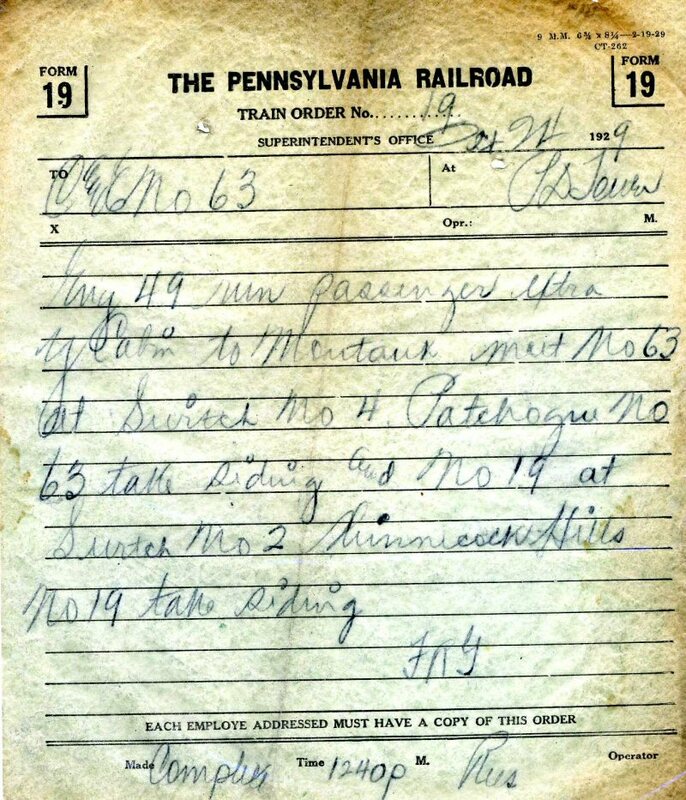 The Form 19, seen below, was a long form train order where all the instructions were written out in long hand, on multiple copies and given to whomever it may concern. The large block of text could confer a movement authority or seed restriction or just about anything safety related that a train needed to do. The Form L on the other hand is broken up with those fill in the blank lines so common on track warrants and other movement permits in use across North America. 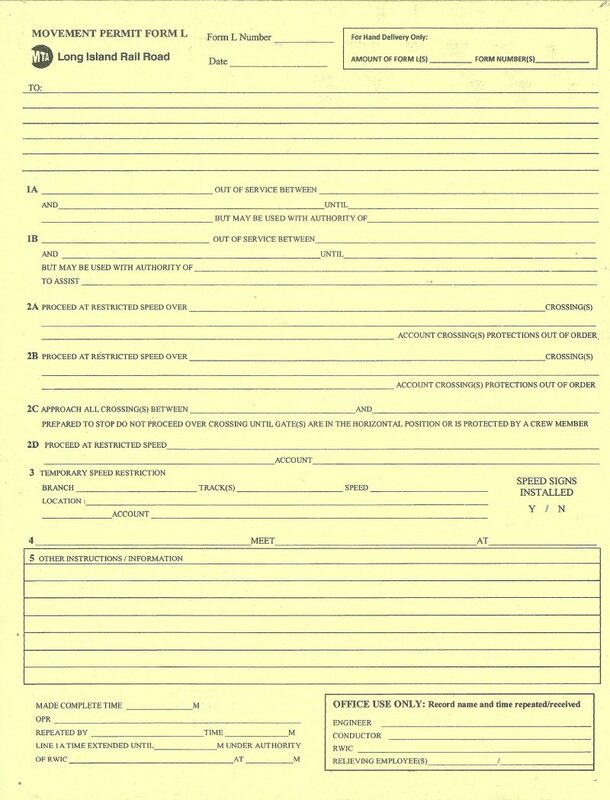 However while most of those other forms have 10 or more fill in the blank lines, the Form L only has 4, and none of them have anything to do with standard movement authority. However there is a 5th block that contains a paragraph worth of blank lines for....hmmm...a long form, hand written block of instructions. Upon inquiring I learned that there have been no alterations to LIRR operating practice except for the elimination of a Clearance Card C for passing a stop signal in favor of the Rule 241 verbal permission past a stop signal. The LIRR still uses its traditional PRR manual block system with K cards, A cards and superior/inferior trains governed by timetable and, you guessed it, train orders. So despite what you might hear, train order operation still lives on at America's oldest railroad. METRA Tower A-2, also known as Western Ave, is one of the most epic interlockings in North America. Unlike many of the well known east coast interlockings like ZOO or UNION or JAY/HALL, Western Ave doesn't have networks of tunnels and flyovers artfully sending trains to their required destinations. Western Ave does things the Chicago way with brute force using diamonds, diamonds and more diamonds. 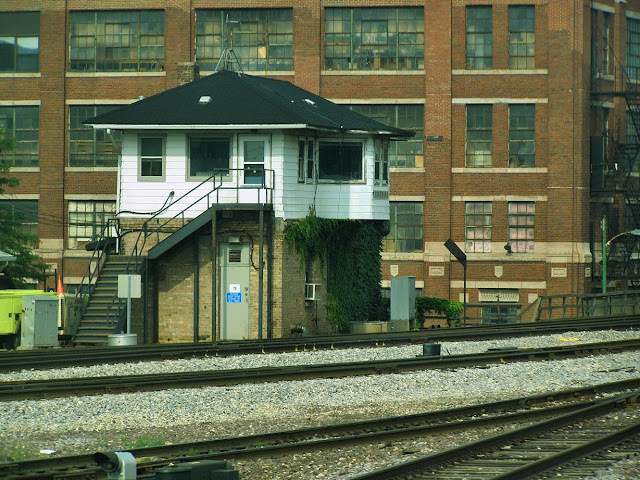 Furthermore, the interlocking plans survives with an active tower and many original appliances from its heyday in contrast to many other large Chicago area interlockings which have fallen prey to resignaling and simplification in recent years. Tower A-2 and the interlocking complex known as Western Ave is located a few miles to the west of downtown Chicago where the present day METRA Milwaukee District crosses the METRA UP West Line. However back in the day the interlocking actually involves three railroads. The heart of the interlocking was where the Milwaukee Road's trunk line to the North and West crossed the former Chicago Northwestern Railroad's main line to the west through Iowa. There is where one four track main line met another four track main line at grade and the only solution was a set of diamonds. Actually, diamonds would have been simple blessing, sort of an Englewood of the north side, as the lines cross at about 30 degree angle which required a set of 16 double slip switches and movable point diamonds to be constructed. This is perhaps the largest such application of double slips and movable point diamonds to ever be installed in North America outside of a terminal location. Just when you thought it couldn't get any better the Pennsylvania Railroad got involved. You see, the PRR didn't just have one route into Chicago. Aside from the familiar route via Fort Wayne, passing through the Quad Draws and 21st St Tower (aka Alton Junction), the PRR operated what was known as the Panhandle Route, named after the West Virginian panhandle through which its main line passed after splitting off the usual main line at Pittsburgh. The line continued on via Columbus, Richmond and Logansport, entering Chicago through the back door, running parallel to the B&OCT up through 75th St Junction and the Brighton Park crossing until it hit the CNW main line where, like a garden hose trained in a brick wall, made a sharp right hand turn to curve back in toward Chicago to the Union Station complex that the PRR owned 50% of. It was at this right turn where westbound PRR trains to Chicago would ironically travel the last 2 miles heading eastbound that Western Ave interlocking and it was actually at this point where the Milwaukee Road's main line into Chicago would end and merge into the PRR's line, under the auspices of the Chicago Union Station holding company. Due to the majority PRR stake, this part of the line was and still is equipped with position light signaling, making the junction at Western Ave a real Chimera. So let's take a quick look at Western and as you can see in this thankfully clear interlocking diagram, its layout borders on the insane. It is similar to the interlockings at either ZOO or Janacia in function, a major sorting and junction point where two trunk lines meet on their way downtown, but like I said this one takes the brute force approach instead of something more elegant with ramps and flyovers. The 83 lever US&S Model 14 interlocking is large, but still modest in size falling well short of at century mark at 83 total levers with 69 active. Like I mentioned before the real hallmark of this interlocking are the doubleslip switches and movable point diamond crossings. Aside from the 4x4 crossing with its 7 doubleslips and 8 MPD's, as built where were two additional doupleslips for a trailing point ladder track on the CNW trunk and three additional MPD's where the Milwaukee Road track join with the PRR tracks. All told there are 11 MPD's and 9 doubleslip switches, numbers unheard of outside of terminal interlockings. It is also interesting to note hot this interlocking was zoned. As you can see there is the Milwaukee /CNW crossing zone and the Milwaukee/PRR junction zone. In the PRR Zone the PRR was of course calling the shots and all of the signals were position light. The CNW tracks of course has CNW type ssearchlight ignals and the last entrance for the Milwaukee Road was equipped with Milwaukee searchlights. As the interlocking plant was built in 1938, all of the signals were of the most modern type (ie no semaphores) and those original signals remain in service to this day, for the most part. At this point I wanted to mention that the photos used for the essay come from a series of my own trips to Western Ave (exterriors) and from a source at METRA (interriors). My own trips were taken in 2007 on an inbound UP West Line train, 2009 on an inbound Milwaukee District train and 2010 on a trip to the Western Ave METRA station. This first photo of the tower was from the 2007 set. Two quick updates. First the twin three track M&W CPL bridges at HULL have been replaced. 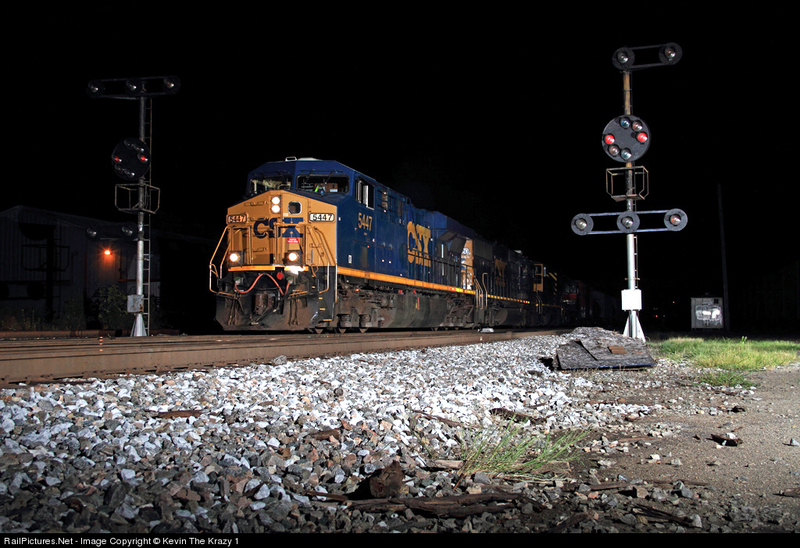 Unlike CSX I guess NS doesn't screw around with re-signaling projects. 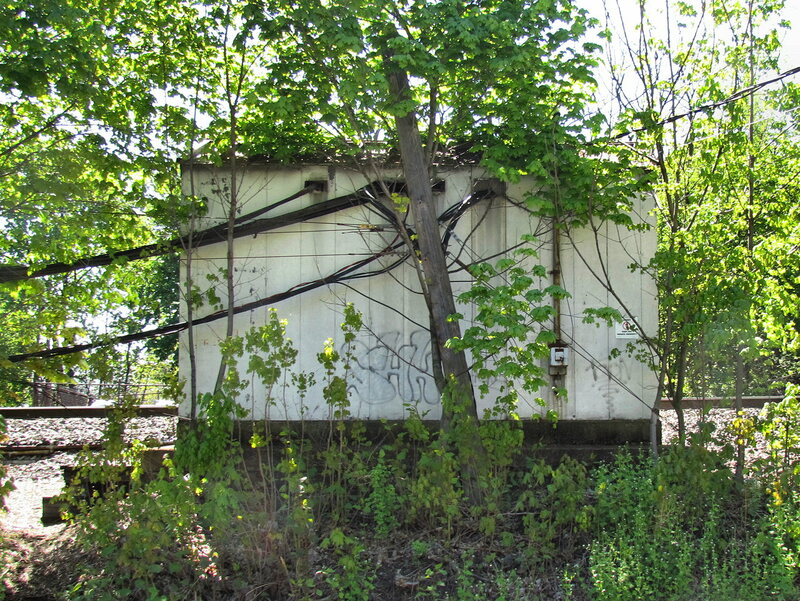 I also identified another 5-orbital B&O CPL in the Cincinnati Area. 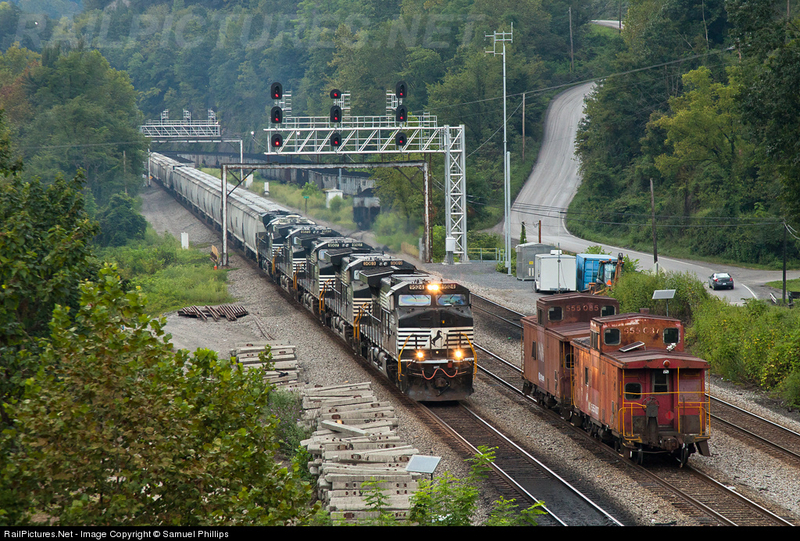 They are at KC Junction across the Ohio River in Kentucky where the B&O meets the old L&N main line.